I'm starting out 2013 with the best chocolate cake I've ever had: a chocolate sour cream cake with chocolate buttercream frosting from Philadelphia's famed Brown Betty Bakery. While this cake is a pretty great way to start off the new year, I must admit, it's not what I had in mind. See the new header up top? I was planning on rolling out all these great new design changes (things like a new background, new buttons, and a new color scheme to match the brand new header), only to have Blogger's template designer simply... not work. That is, clicking the "Apply Changes [to Blog]" button doesn't register any at all. After researching the issues, it seems like this is a bug that's been around since July 2012. Shame on you Blogger (or, more specifically, Google) for not getting this fixed! Are any other bloggers out there experiencing this issue too? If so, how'd you get around it? But enough, I won't bore you with my blogger issues. If you stuck around during the holidays and read my roundup posts, you'll know that I critiqued some of my favorite recipes and least favorite recipes in 2012. As I was writing the lookback, I realized that a lot of my favorite recipes came from cookbooks. As much as I love food blogs, I realized I missed having a solid, reliable cookbook to rely on, that had unfussy recipes and used simple ingredients. At the end of the day, this blog started out with my attempt to bake through The Hummingbird Bakery Cookbook. While The Hummingbird Bakery Cookbook is great and has all those qualities I described, it consists primarily of cupcakes and not a whole lot else. Especially not any cake recipes. Which is problematic, since people are always asking me to make cakes for housewarmings, baby showers, and other party-type events. So it's about time I find a good cake book to rely on. 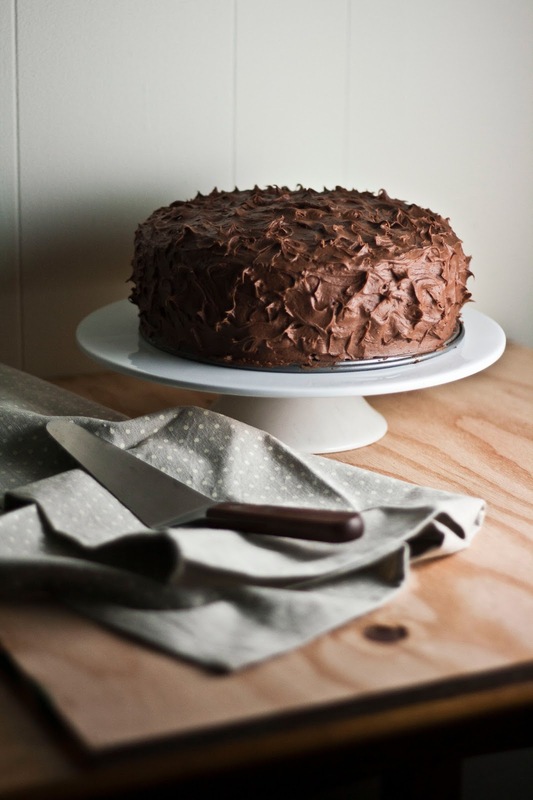 According to the cookbook, this recipe is their take on chocolate diner cake. Do you guys know the kind of diner cake I'm talking about? In almost every classic diner, a cake stand or glass dome along the diner's bar holds the moistest, fluffiest chocolate cake I've ever eaten. I don't know what makes diner cake so good, but it's honestly the best out there. I've always tried to recreate it at home with little success — until now. This cake is so incredibly delicious that I ate a quarter of it in one sitting. The frosting, good lord, the FROSTING is the best chocolate frosting I've ever had in my life. The secret? A little bit of cream cheese goes a long way. That's the secret all those professional bakers are holding back from you. Behind every great buttercream recipe is some cream cheese frosting. And spreading a cup of that amazing frosting between each layer. 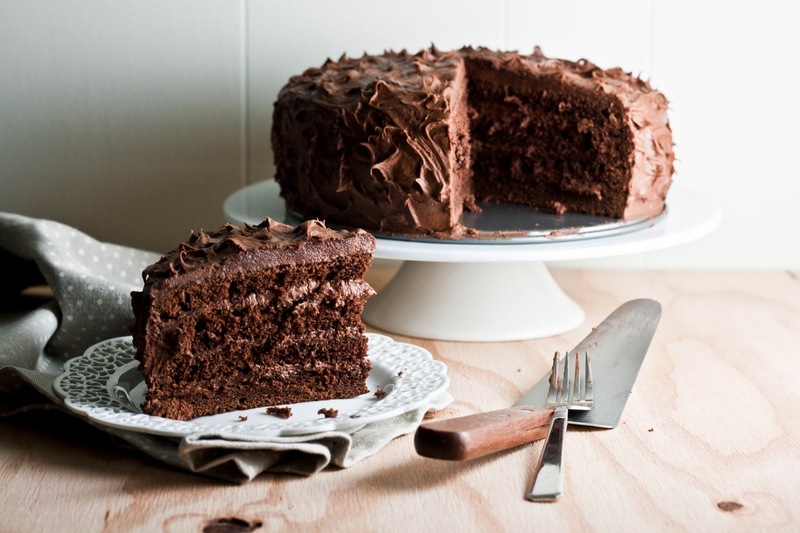 According to the cookbook, this creates a more evenly divided cake to buttercream ratio that's responsible for that a gooey, fudgy chocolate cake. And so begins my love affair with the Brown Betty Bakery. Maybe I'll spend January baking through their cookbook. Or finally go see my brother in Philadelphia to get a taste of the real thing. In any case, expect to see more recipes from the Brown Betty Cookbook in the near future. I'm sure this cake is just the start of more great things to come. Preheat the oven to 350 (F). Coat two 9-inch round pans with nonstick cooking spray, and line the bottoms of the pans with parchment paper. In a medium bowl, mix together 3/4 cup sour cream, 1/2 cup plus 3 tablespoons cocoa powder, 2 eggs, 2 egg yolks, and 1 1/2 teaspoons vanilla until smooth. In the bowl of a stand mixer fitted with a paddle attachment, beat together 2 1/4 cups cake flour, 1 teaspoon baking powder, 1 teaspoon baking soda, 3/4 teaspoon salt, and 1 3/4 cups granulated sugar on low speed just until blended. Add 1 cup unsalted butter and half of the cocoa mixture (from the second step) to the flour mixture (from the third step) and beat until the dry ingredients are moist. Increase the mixer speed to medium and beat until smooth, about 2 minutes. Gradually add the remaining cocoa mixture in 2 batches, beating well after each addition. Add 1/2 cup boiling water and beat until smooth. Divide the batter equally between the prepared pans and smooth the tops with an offset spatula. Bake until a wooden pick inserted into the center comes out clean, about 30 to 35 minutes. Let the cakes cool in the pans for 10 minutes before turning them out onto a wire rack to cool completely. Remove the parchment paper. In the bowl of a stand mixer fitted with the paddle attachment, beat 6 ounces cream cheese and 4 teaspoons vanilla together on low speed until smooth. Increase the mixer speed to high. Add 1 cup butter and beat until incorporated, using a rubber spatula to scrape the bowl as necessary, about 1 minute. Reduce the mixer speed to low and beat in 1 cup cocoa powder and 1 tablespoons plus 1 teaspoon light corn syrup. Add 7 cups confectioners' sugar and beat until blended. Add 3 to 6 tablespoons of whole milk, one tablespoon at a time, beating until the buttercream achieves a spreadable consistency. Set aside until ready to use. When the cake is completely cooled, use a large serrated knife to cut each of the 2 layers in half to make 4 thin layers in total. Place the first layer on a cake plate, and use an offset spatula to spread 1 cup of buttercream on top. Repeat with the next 2 layers. Place the final cake layer on top and spread the remaining buttercream on the top and sides of the cake. I am pinning this cake now and can't wait to try it. And, I agree about the cream cheese in buttercream. It is my secret too! So sorry about the blog stuff not working...grrr. Although the new header looks beautiful! I'm in love with that lacy plate and can think of a million things I want to eat off of it! Thanks, I stole it from my mom's cupboard while I was home for the holidays, hahaha! It's from Pier One Imports. This looks so decadent and incredible! This cake looks ABSOLUTELY SCRUMPTIOUS. Could you please state a substitute for "sour cream", can't find it here in Pakistan. Oops, just saw this now. This is a bit of a stretch, but I would try plain yogurt. I would also try making your own sour cream, which you can find recipes for online. Hello michellelo2009. 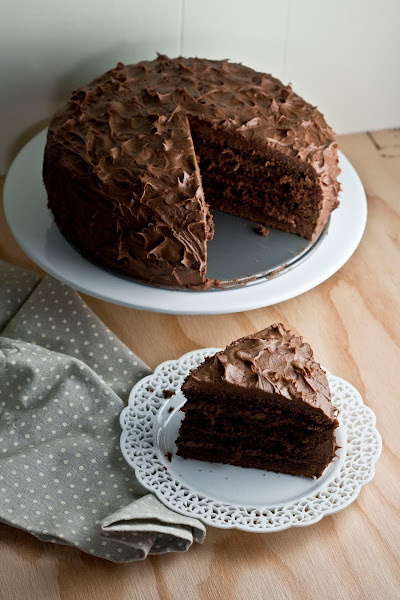 Thank you for posting this mouth-watering chocolate cake recipe. I plan to make it for dessert on Superbowl Sunday. I have a couple of questions. First, I am unsure concerning the cocoa powder. Is it, 1/2 cup, plus 3 tablespoons of "unsweetened cocoa powder," AND 1/2 cup, plus 3 tablespoons of Dutch-process cocoa (totaling, 1 cup, 6 tablespoons of unsweetened/Dutch-process cocoa powder)? I would hate to make the mistake of just using the Dutch-process cocoa. I know your recipe instructions came from the cookbook. For the frosting -- did you have extra icing leftover after completely frosting the cake? The frosting recipe appears like it could possibly frost two 9-inch cakes. 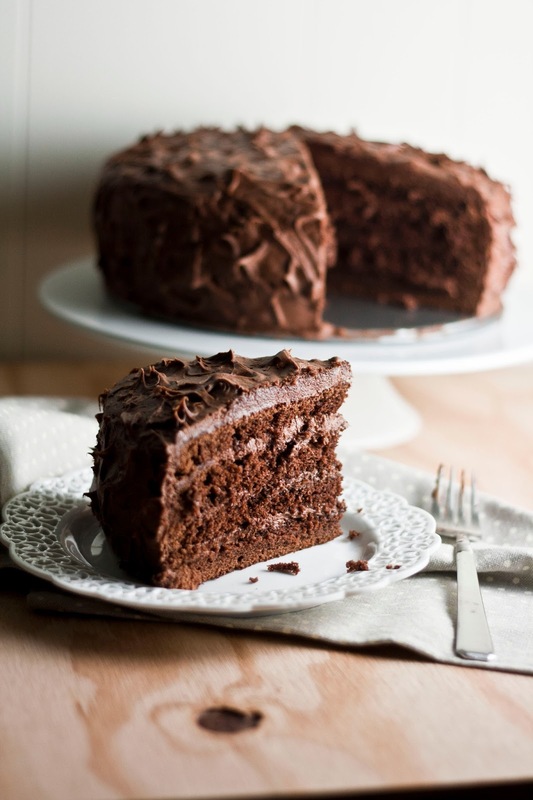 Did the 7 cups of confectioners' sugar make the cake really sweet? Your final product looks fantastic; I could only hope my first attempt to make this cake comes out half as good as yours. Thanks again, Gerald. - Yes, the recipe calls for two types of cocoa powder — natural unsweetened and Dutch-processed. 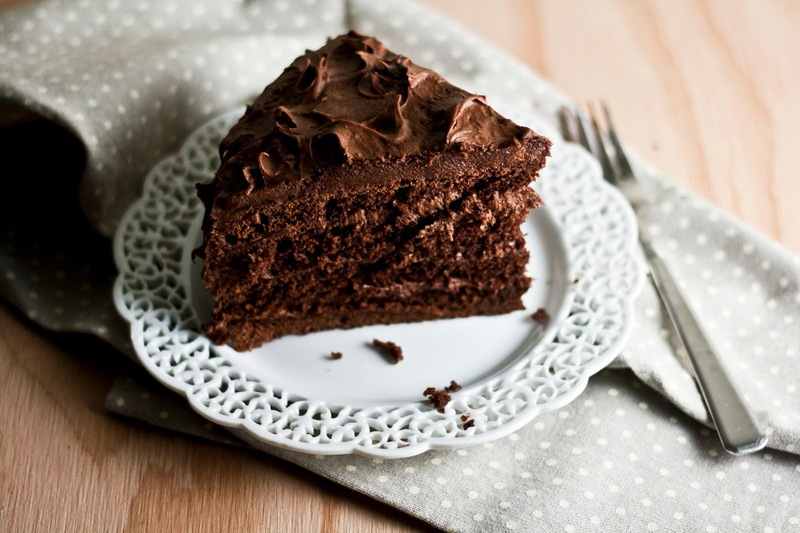 According to the cookbook, the reason for doing so is because it creates the perfect balance of a deeply intense chocolate flavor (caused by the natural unsweetened cocoa powder if used alone) and a milder, less chocolatey flavor (created by the Dutch-processed cocoa powder if used alone). In my opinion, you can probably get away with using just one type of cocoa powder. In total, you would be using 1 and 3/4 cups of cocoa powder, which isn't that crazy for a chocolate cake (6 tablespoons = 3/4 cup, a quantity that sounds more in tablespoon format). - For the frosting, I did have extra leftover, but only about a half cup or so. 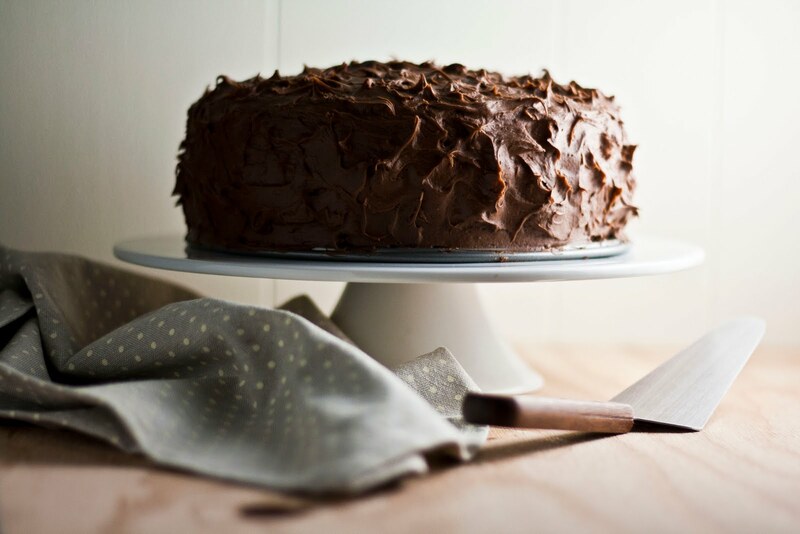 You'll want to make the full recipe for the frosting, because it really is the star of the cake. 7 cups of conectioner's sugar does make for some sweet frosting, but there are a few things that balance the frosting's sweetness out. Firstly, the frosting uses both butter AND cream cheese, and the cream cheese adds a nice tang/smoothness that makes this frosting unique. Secondly, the cake base itself is actually not that sweet (due to the high amounts of bitter cocoa powder), so the frosting does a nice job of really balancing things out. I hope that helps! Let me know if you have any questions, and feel free to email me at michelle@hummingbirdhigh.com. Hi! I really want to try this for my daughter's birthday this weekend....but she has asked for cupcakes. Do you think this would do well as a cupcake? Any adaptions you would suggest? THANKS!! I just checked the cookbook that I got the recipe from, and it turns out the cakes make great cupcakes too! According to the cookbook, each cake recipe makes at least 20 cupcakes+ and can be baked at 350 (F) for 23 to 24 minutes. I've never done it myself, so let me know how it works out for you! I just made this today for my daughter's birthday. We haven't cut it yet and I am so excited. First time I have ever a cake from scratch! ! What about making it in a 9x13 pan instead of the 2 round pans? Also, where do I find the 2 kinds of cocoa powder? Oops, sorry, I just saw this now! I've never made it in a 9 x 13 pan, but I'm sure it'll work if you adjust the baking time appropriately. Both Dutch-processed and natural cocoa powder is available at any grocery store, just be sure to read the labels properly! Sometimes cocoa powders are a mixture of both. Just found this searching for chocolate sour cream cake on Google. I've had heaps of problems with the Blogger platform lately. Thinking of going over to Wordpress. Blogger just doesn't seem to move with the times. Funny you said that! I'm just in the middle of writing a blog post about Blogger vs. Wordpress vs. Squarespace. I recently redid my blog's design (which you can read about here: http://www.hummingbirdhigh.com/2013/03/blog-redesign-pt-1-choosing-my-design.html ), so come back soon for the post about different blogging platforms. How can I adapt this recipe to high altitude? My cakes tend to sink in the middle :(. I live in Colorado. Sorry to hear that you had a bad experience with this cake, but upon reading your comments, I knew immediately what you did wrong, and you had guessed it yourself towards the end of your comment. The ingredients calls for only 1/2 cup plus 3 tablespoons of both cocoa powder and Dutch processed cocoa. What that means is that you would essentially be mixing 1/4 cup plus 1.5 tablespoons natural cocoa powder and mixing that with another 1/4 cup plus 1.5 tablespoons Dutched cocoa. It sounds like you used 1/2 cup plus 3 tablespoons of natural AND dutched, which means you used wayyyy more than you should have. Apologies for the confusion, and I'll make a note up top soon so that others won't make the same mistake you did. Thank you for the clarification. The cake sounded delicious so I was disappointed. Knowing there was a mistake with the amount of cocoa, means I can try again and have a better outcome. Thank you for the reply. Hello really want to make this cake but only have Dutched cocoa. How important is it to use both types? I did replace the buttercream with cocoa cream cheese frosting and topped it with peanut brittle, a definite keeper of a recipe. What do i have to alter if I want to bake it in a 6inch cake pan?